In the spirit of Solange's Twitter posts last Thursday, I'm about to rant a little bit. 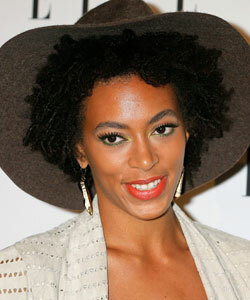 Solange is sick of the natural hair police and frankly, so am I. Wearing your hair naturally, the way it grows out of your head is supposed to be liberating for us all. As a community of naturally curly folks, we have the opportunity to encourage one another to embrace our natural textures and to rock our curls, twirls, waves and coils however we please. Shouldn't being natural be about being free from the pressures to conform to what other people say is an acceptable way to wear are hair? I know that it makes many naturals furious, or at the very least a bit annoyed, when someone tries to say a curly should straighten because it looks more…you fill in the blank. So why are we doing this to each other now? Actress Nicole Ari Parker said it well on MSNBC's Melissa Harris-Perry show: "We even judge each other—we were just talking about Solange being very upset on Twitter, but it's because there is still this thing about getting your hair done. Whether it's an afro, whether its twists or braids or relaxers, everybody wants their hair done, so [Solange] — you know, embraces just get up and go, and she's beautiful." This natural hair movement that's more than a movement has finally given us a new sense of pride about our hair and about ourselves. Why kill that by cutting each other down? At the very least, can't we can agree to disagree about how we want to wear our own hair? Maybe I'm just being too idealistic, but this is what I think. More importantly, though, what do you think? Natural Hair: A Trend or a Growing Movement?